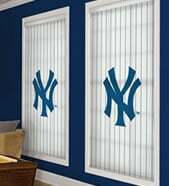 Our sports blinds and shades are perfect for that man cave or your kids room or anywhere else you want to spice up with a sports theme decor. Shop your favorite teams from Major League Baseball™, the National Hockey League®, or your favorite college team. Be the ultimate fan in you neighborhood by supporting your alma mater or favorite sports team. All your friends will envy your sports themed window blinds. The Official blinds of Major League Baseball™. Choose your favorite MLB™ team. 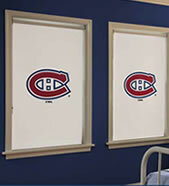 Each roller shade comes in the official team logos and colors. Choose your favorite NHL hockey team. Shop from each of the National Hockey League® teams official logos and colors.